Raspberry Champagne Spritzer - A recipe from Savor California, the online showcase for extraordinary gourmet foods and beverages from California. 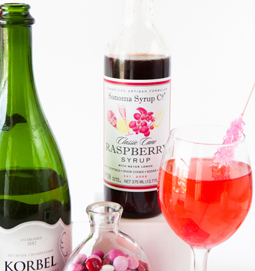 Sonoma Syrup Co. collaborated with Melissa from the gorgeous blog, Design, Eat, Repeat to make this festive spritzer. Stir together champagne, raspberry carbonated water, and raspberry simple syrup in a large measuring cup. Once mixed together, add food coloring (if desired). * Recipe makes 1 serving, but you may double, triple, or quadruple the recipe to serve more people.